About the Laboratory: It is a modern computer based laboratory which possesses 34 no of computers. All the computers are updated and working properly including the internet facility and all the machines are secured with modern licensed antivirus. Generally the students of Computer Science and Engineering as well as the other Departments also take the facility of this laboratory for Database Management System, Data Structure and Advanced Database Management System. The students and the faculties can enhance their knowledge by the hope of internet facilities provided in this laboratory. Moreover the student also works with C, Oracle, Oracle Clint+ for their regular curriculum and their project works. This laboratory is really an asset of the Computer Science and Engineering department..
About the Laboratory: It is a modern computer based laboratory which possesses 34 no of computers. All the computers are updated and working properly including the internet facility and all the machines are secured with modern licensed antivirus. Generally the students of Computer Science and Engineering and the other departments also take the facility of this laboratory for Basic computation and principle of Computer Programming Lab, Data Structure and Object Orient Programming. The students and the faculties can enhance their knowledge by the internet facilities. More over the student can work with C and C++ . C++ is a Object Oriented Programming language which helps the students in their projects. About the Laboratory: It is a modern computer based laboratory which possesses 35 no of computers. All the computers are updated and working properly including the internet facility and all the machines are secured with modern licensed antivirus. More over two types of Operating System are available at each and every machine. 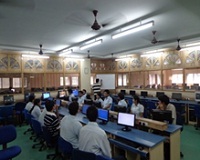 Generally the students of Computer Science and Engineering and the other departments also take the facility of this laboratory for Object Oriented Programming, Shell Programming, JAVA and Clint Server Program using C. The students and the faculties can enhance their knowledge by the internet facilities.